St Loy Lands End - Holiday Cottages, B&B, Apartments. 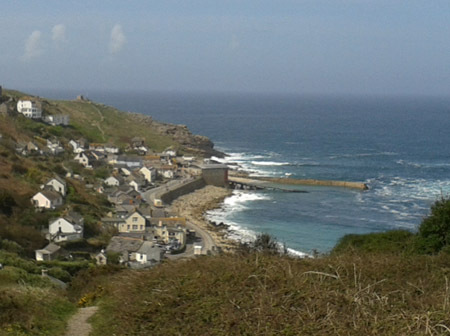 Holiday Home Rental accommodation in Sennen Cove. Touring Caravan holidays and Camping trips are growing in popularity many holiday parks in Cornwall offer camping and touring pitches so whether you have a tent, caravan or motor-home you can enjoy a stunning holiday in Cornwall at a fantastic location with great facilities in Cornwall within easy reach of Sennen Cove. Cove Cottage St Loy, lands End had advertised their en-suite, B&B holidays with sea views, in this stunning West Cornwall holiday location since December 2002. Offering a world away from the hustle and bustle of modern living... where you could relax, at a slower pace of life, in a very special atmosphere. 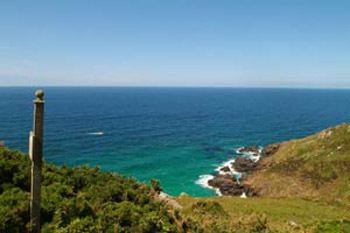 Luxury Bed and Breakfast and Cottage Holidays in one of the most beautiful and romantic situations in West Cornwall. Perfect for couples who want to get away from it all and enjoy the most spectacular, panoramic views in perfect peace and seclusion. Opportunities to relax unwind and awaken your senses to the magic of hidden West Penwith. Great for exploring the Lands End Peninsula, Penzance, St.Ives and St.Michaels Mount. We are right on the coastal path between Lamorna and Penberth Coves. Nearby is the famous Minack Open-air Theatre as the Merry Maidens stone circle and numerous other fine white sandy beaches. St. Loy is reputed to be the warmest cove in the United Kingdom and the vegetation reflects this. The woods of the valley stretch down to the boulder-strewn cove. Towering echiums reach high above glossy acanthus alongside the stream bordering the garden, with tree fern and gunnera providing a sub-tropical backdrop for the more tender plants within. Spring arrives early here and from early February the valley is filled with daffodil and narcissi in abundance, followed by a carpet of bluebells in May. Birdlife is varied and fascinating, ranging from the sight of diving gannets and circling buzzards, to the tapping of woodpeckers alongside tame chaffinch and the occasional shy hoopoe or egret. We often see the huge basking sharks cruising around the cove in warm weather as well as the thrilling sight of leaping dolphins. The area offers excellent restaurants in St. Ives, Mousehole, Sennen and Penzance and the local pubs also provide great atmosphere and bar food. Wake to the call of the seabirds circling the Penberth fisherman pulling his crab pots. While you breakfast on the terrace watch the local diving boat checking the abandoned wrecks beneath the deep waters of the Cove. Surrounded by the sea and the mythical and historic Celtic landscape of the Lands End peninsula, is an ideal base to explore the many and diverse sights in this area of Far West Cornwall. Holiday cottages and self-catering stays close to fabulous sandy beaches at Sennen Cove, Porthgwarra and Porthcurno, and nearby is the famous Minack Theatre, Cornwall's Theatre under the Stars. Penzance, Mousehole, St Ives and St Michaels Mount are all within easy reach. Falmouth with the National Maritime Museum is a short drive away, and there are many outstanding gardens in the locality and further afield, including Trengwainton, Trebah and Trelissick. And no visit to Cornwall is complete without a trip to the Eden Project and the Lost Gardens of Heligan. A wealth of art galleries, including Tate St Ives, and an amazing choice of restaurants can be found in Penzance, Newlyn and St Ives. St Just Self-catering Holiday rental with Sea Views. 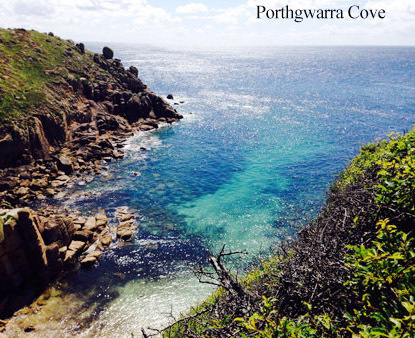 Porthgwarra, Lands End Self-catering Holiday rental with Sea Views. Stylish properties in stunning coastal locations. 6 beautifully renovated houses, sleeping 2- 8 - some with panoramic sea views, others just yards from the beach at Porthgwarra Cove. Come and enjoy cliff walks, sandy coves, surfing and St Ives, as well as exploring the island castle of St Michaels Mount. 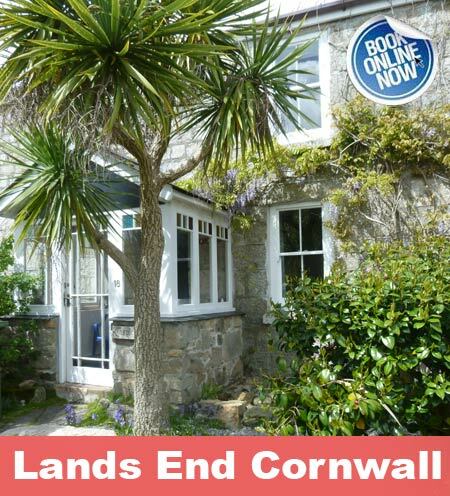 Lands End Self-catering Holiday rental with Sea Views. 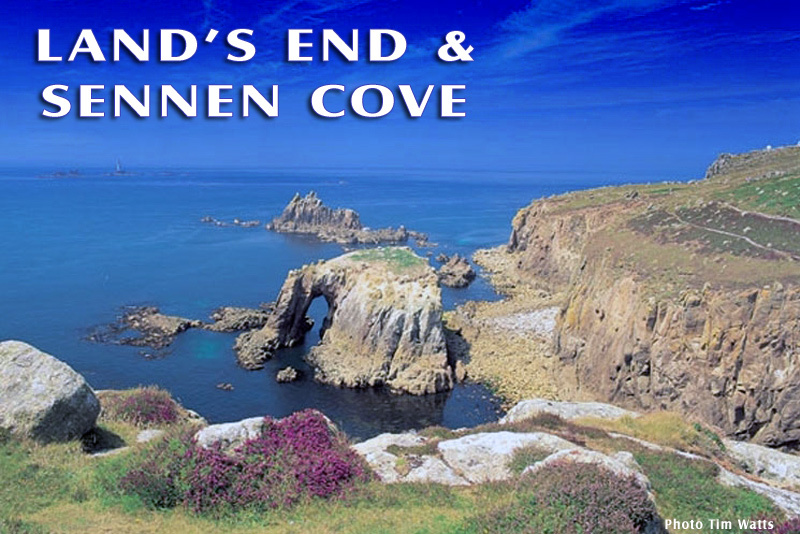 En-Suite Bed & Breakfast (B&B) Holiday Stays in Lands End with Sea Views. Friendly, family run accommodation in an idyllic location, set in a converted Mill Barn with views of Lands End and The Isles of Scilly. Located in the heart of Trevescan Hamlet, the last Hamlet before Lands End just 1/4 mile away. At Lands End Hostel and B&B Accommodation in Lands End Pets are Welcome - Dog friendly establishment. 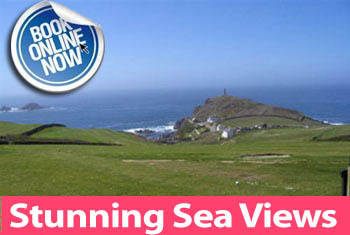 En-Suite Bed & Breakfast (B&B) Holiday Stays in Sennen with Sea Views. 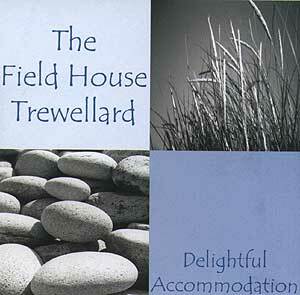 En-Suite Bed & Breakfast (B&B) Holiday Stays in Trewellard with Sea Views. 2 Lovely en-suite double rooms with sea views. Almost a mini apartment, with a fabulous roof top terrace with sea views and, separate but adjoining, private sitting room, creating a spacious accommodation for your holiday. 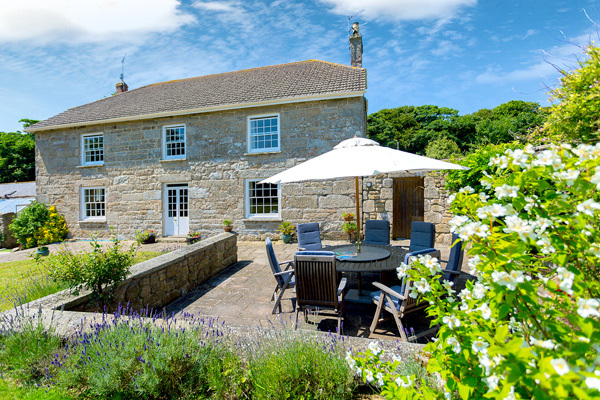 Overlooking fields and sea beyond and situated on the stunning coastal route from St. Ives to Lands End. Morvah near St Just Self-catering Holiday rental with Sea Views. 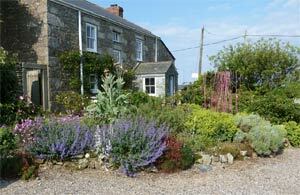 Bed & Breakfast (B&B) Holiday Stays in Morvah near St Just with Sea Views. Camping and Touring | Camp sites in Morvah near St Just with Sea Views. 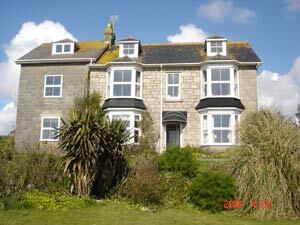 St Ives Self-catering Holiday rental with Sea Views. At Trevalgan Holiday Farm in St Ives Pets are Welcome - Dog friendly establishment. 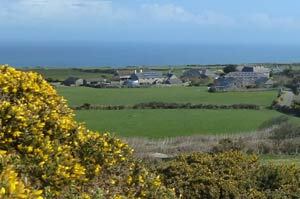 Trevlagan Holiday Barns are situated just off the spectacular coast road between St Ives and Zennor. Consisting of 4 holiday cottages surrounded by wonderful scenery. 4 star accommodation. You can visit St Ives with its superb sandy beaches and cobbled streets just 1.5 miles down the road. Four Holiday cottages Sleeping 2, 4 and 5 people. 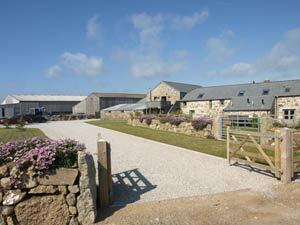 At Trevalgan Holiday Barns in St Ives Pets are Welcome - Dog friendly establishment. 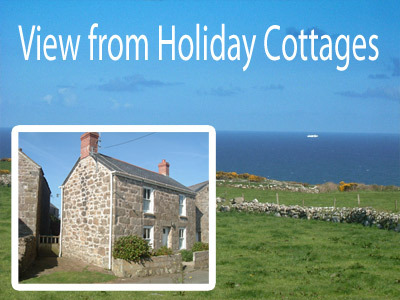 Pendeen, Penzance Self-catering Holiday Cottage rental with Sea Views. Traditional Cornish holiday cottages with sea and rural views situated midway between St Ives and Lands End. Glorious walking country on the nearby coast path and inland over the Penwith Moors. Portheras Cove less than a mile away. 2 and 4 bed cottages and a larger 3 bed (former) School sleep from 2 to 8 people. At Merthyr Farm Holiday Cottages in Pendeen, Penzance Pets are Welcome - Dog friendly establishment. Situated in the village of Sennen in a quiet cul-de-sac .These two modern bungalows are next door to one another and each stand in their own lawned gardens with patios, there are lovely views of the sea and countryside perfectly located for the beach. At Mariners & Wayfarers in Penzance Pets are Welcome - Dog friendly establishment. Casple Cottage is a traditional miners cottage which has been sensitively refurbished to preserve its original character with exposed beams and exposed granite walls.